The Toyota Corolla holds a number of distinctions. It was the automaker's first car sold in the U.S., starting in 1968, and has since become the bestselling car in the world, with more than 30 million cars sold worldwide. Seven million of those were sold to U.S. owners. 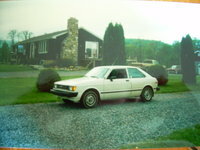 In addition, the Corolla was at the forefront of a series of cars that helped establish Toyota's reputation for value, quality, and affordability. 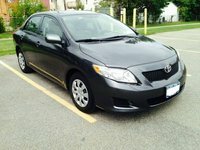 In recent years, however, Toyota's reputation for quality in particular has taken a huge hit, due largely to massive recalls for problems with accelerator pedals, which affected the 2009-10 Corollas. Other recalls for problems with engine control modules and floor mats affected certain Corollas built between 2005 and 2010. 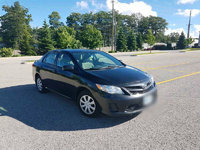 On the plus side, the Corolla remains an affordable, comfortable, and dependable option for budget-oriented buyers who seek a fuel-efficient compact commuter car. Currently in its tenth generation, the four-door, front-wheel-drive Corolla comes in Base, LE, XLE, S, and XRS sedan trims. A 132-hp, 1.8-liter four-cylinder engine powers all but the XRS trim, which sports a 158-hp, 2.4-liter four cylinder under its hood. Mileage ranges from 25/35 mpg for the Base trim with a five-speed manual transmission to 22/30 for the XRS with the larger powerplant. While the Toyota Corolla continues to excel in budget-minded affordability, competitive vehicles, such as the Mazda3 and the Kia Forte, deliver better performance and more extensive lists of standard features. In addition, the Corolla's bland exterior design fails to impress some reviewers. The minimalist interior emphasizes functionality over upscale features. Even the XRS's unique interior, designed to impart a sporty feel, instead seems simply budget-oriented to many reviewers. 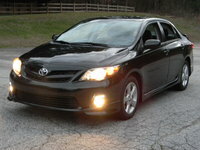 Generally, however, Corolla owners will find comfortable seats, good visibility out the back, and a quiet cabin. With a complete makeover in its recent past, an 11th generation Corolla remains several years in the future. However, prospective owners can no doubt expect a Corolla with a redesigned accelerator pedal in the near future, as well as (we hope) improved steering feel, since the current system feels numb to many owners. 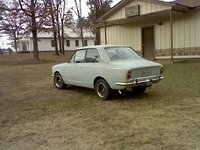 The Corolla started off in Japan in 1966 as a two-door, rear-axle-powered vehicle (called the E10 internally) with a 90-inch wheelbase and a 60-hp, 1.1-liter four-cylinder engine. But by the time it arrived on U.S. shores a couple of years later, the Corolla line had expanded to include a four-door sedan and a two-door wagon, as well as the two-door coupe. 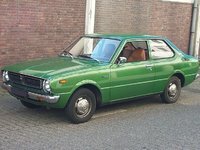 However, the first-generation Corolla proved to be too small and underpowered for American tastes, so the automaker stretched the second-generation Corolla (the E20), which debuted in 1970, by nearly 2 inches and added a bit more power via a 1.2-liter, 73-hp four-cylinder engine. In addition, for the first time, Toyota offered the Corolla with an optional automatic transmission. Sales took off, and the Corolla was on its way to becoming the world's bestselling car. 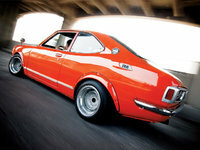 Other second-generation highlights included a larger 1.6-liter, 102-hp engine, which revved up in 1971, and a sporty new SR5 coupe trim, which entered the lineup in 1973. Trim levels included Standard, Deluxe, and Hi-Deluxe. 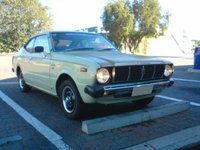 Both the larger 1.6-liter engine and the SR5, along with the older 1.2-liter engine, carried forward into the Corolla's third generation (E30 through E60), which bowed in April 1974 for the 1975 model year. Trims included a two-door sedan, a four-door sedan, a two-door hardtop, a five-door station wagon, and the SR5. 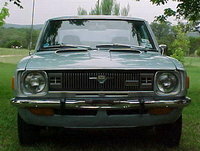 The 1.6-liter engine powered all but the entry-level two-door sedan, which retained the older 1.2-liter engine. 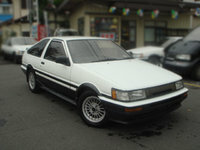 All came standard with manual transmissions (five-speed for the SR5, four-speed for the others), although Toyota offered an optional three-speed automatic. 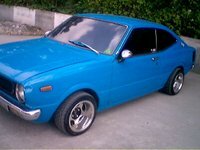 In 1976, the automaker added a two-door Liftback and a Sport Coupe, which adopted the fastback styling popular at the time. Third-generation trim levels included Base, DX, and E5. 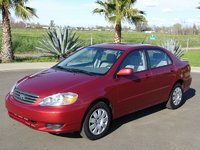 Toyota squared off the Corolla's exterior lines and updated the compact car's chassis for the fourth generation (E70), which debuted in early 1979. 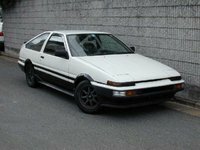 Toyota also introduced a new 1.8-liter, 75-hp four-cylinder engine to the lineup and, in 1982, added a new four-cylinder transmission. The SR5 came in Liftback, Hatchback, and Sport Coupe trims, as well as sedan and station wagon configurations, giving buyers a wide range of options. 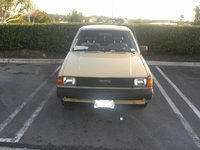 Prior to 1984, the Corolla was a rear-wheel-drive car. That changed with the introduction of the Corolla's fifth generation (E80), when the automaker switched to a front-drive configuration with an independent rear suspension (although some SR5 trims and the station wagon retained the older, rear-drive chassis). 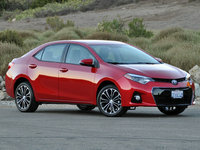 Toyota also continued to stretch the Corolla's wheelbase, which now checked in at 95.6 inches. 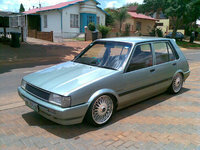 Trims included four-door and five-door (six-window) sedans, as well three- and five-door hatchbacks. 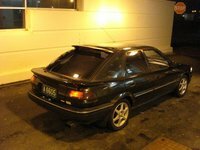 In 1987, the automaker introduced the Corolla FX coupe, which was the first Corolla trim built in the U.S. at a plant in California. Trim levels included Standard, DX, and LE. 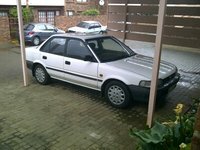 The sixth generation Corolla (E90), which appeared in May 1987 for the 1988 model year, was wider by 2 inches, though the same length as the previous generation. 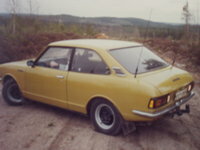 Toyota rounded off the Corolla's square edges and introduced a front-drive coupe, a GT-S, and a front-drive wagon, as well as an all-wheel-drive All-Trac wagon. 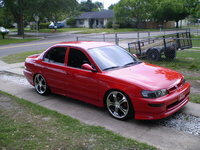 The automaker also added an All-Trac sedan to the lineup, but it lasted only a year. Powerplants included a DOHC, 90-hp four-cylinder, a fuel-injected 100-hp four, and a 115-hp four with electronic fuel injection for the sport GT-S. 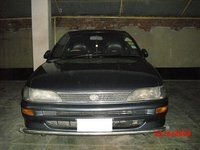 Trim levels included DX and LE, as well as SR5 and GT-S.
A longer seventh-generation Corolla (E100), with a 97-inch wheelbase, debuted in Japan in June 1991, though it was tagged for the 1993 model year in the U.S. and Europe. Again, it featured a rounded, more fluid exterior design and optional antilock brakes for all trims. However, the automaker dropped the coupe and all-wheel-drive trims from the lineup, focusing instead on front-wheel-drive sedans and wagons in DX and LE trim levels, although Toyota added a CE trim level in 1997. 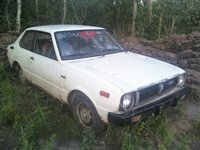 That same year, the Corolla became the bestselling car in the world. 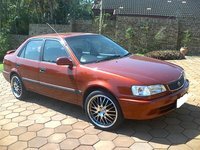 For the Corolla's eighth generation (E110), introduced in Japan in May 1995 for the 1998 model year in the U.S. and Europe, Toyota debuted the Corolla's first aluminum-block engine, a 120-hp, 1.8-liter DOHC four-cylinder. The lightweight engine helped reduce the Corolla's overall weight and improve fuel efficiency, which was rated at 38 mpg at highway speeds for a Corolla sedan equipped with a five-speed manual transmission. In addition, the wagon disappeared from the lineup, as Toyota offered the compact car only in a sedan configuration with VE, CE, and LE trim levels. 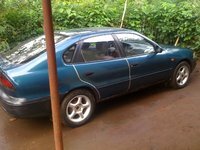 In addition to antilock brakes, options included side airbags and a CD player. 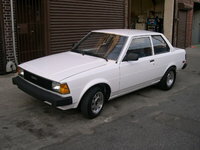 Truly a world car, the Corolla was now produced in eight countries on six continents, with unique styling cues for individual markets. The wheelbase stretched by more than 5 inches, to 102.4 inches, for the ninth generation (E120/E130), which appeared in November 2000 for the 2003 model year in most of the world's markets. Stylewise, the redesigned Corolla closely resembled its big brother, the Camry, with its flowing lines. 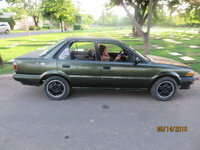 Inside, Toyota went for comfort, quality, and ergonomics, and added air conditioning, a CD player, power windows, and 15-inch wheels to the standard equipment list. In addition, the 1.8-liter four-cylinder engine received a bump in horsepower, to 130, while fuel economy numbers checked in at 28/40 mpg for the base configuration with a manual transmission. Trim levels included the base CE, the sporty S, and the high-end LE. The Corolla's current 10th generation (E140/E150) debuted in Japan in October 2006, though it was tagged for the 2009 model year in most of the world. Like previous generations, it emphasizes affordability, dependability, and fuel economy, though its design remains conservative when compared to some competitors. 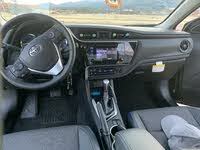 Similarly, interior quality and the standard features list suffer a bit when compared to competitors, as well as to the Corolla's previous generation, as buyers now have to step up to the LE trim for such features as power windows and door locks. 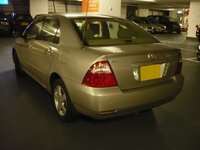 While its length remains about the same as the previous generation, it's a tad wider, resulting in slightly more shoulder and hip room, especially in the back seat. Throughout its decades-long run, the Corolla has been best known for its longevity, with some owners claiming their cars have racked up more than 500,000 miles. As a result, prospective buyers have plenty to choose from when considering used Corollas. 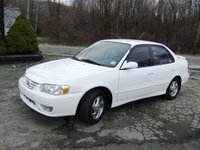 However, due to their high resale values, used Corollas can seem expensive when compared to some competitive vehicles. Despite the recent recalls, Corollas built since 1994 have received better-than-average safety ratings. The 2010 version, for example, received a Top Safety Pick nod from the IIHS. Owners seeking to avoid accelerator-pedal problems can look to Corollas built before 2009. Specifically, ninth-generation Corollas make good prospects as used vehicles. Even the base trim comes well-equipped with power windows and a CD player, and many consider the cabin roomy and well-appointed. 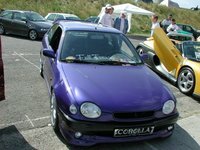 In fact, most Corollas built from the mid-1990s onward make good buys as used cars. 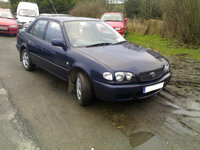 Corollas built prior to 1994, however, have only average safety ratings, unless equipped with optional antilock brakes. 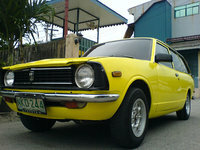 Corollas built in the 1980s generally have below-average safety ratings. 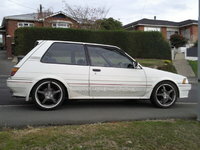 Owners looking to older Corolla generations also have a wider range of trims from which to choose. For years after production ended, the Corolla All-Trac station wagon remained especially popular as a used car option, and a few still remain on the road today. Similarly, the sporty SR5 and S trims of previous generations, as well as well-equipped high-end LE trims, are worth seeking out. 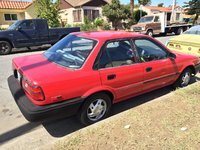 Prospective owners on a budget may also want to seek out Geo Prizms, which essentially were GM-rebadged Corollas, produced in a Toyota/GM jointly owned plant in California. 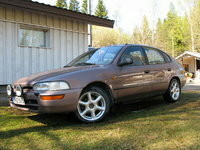 In particular, third-generation Prizms, produced from 1998 to 2002, remain possible used-car options. 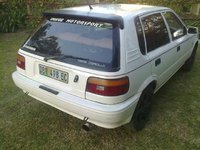 However, with the third generation, the Prizm was badged as a Chevrolet rather than a Geo, which helped lead to its eventual demise. 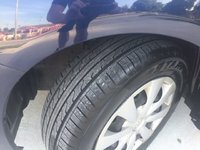 I have a 2014 Toyota Corolla. The air is blowing hot. Tried to fill with Freon but it said it was filled. Compressor is running fine.